The year is mostly over, so I thought I would take a look and see what’s going on in the Eastern District of Texas. The Eastern District of Texas still has more patent cases filed there than any other district at 1,224. Some 794 (that’s about 8% of all patent cases) of those cases were assigned to Judge Rodney Gilstrap, in the Marshall Division — almost 10 times more than any judge outside the Eastern District. That’s more than twice as many as the entire District of Delaware (311 cases), even though most big companies are incorporated in Delaware. In fact, Judge Gilstrap, a judge in a small town in Texas, is handling about as many patent cases as Delaware, California, Illinois, and New Jersey combined. Marshall, Texas has a population of about 25,000 people. It has no major research facilities, no major industries, and has not produced any major innovations that I can identify. And yet it hosts more patent litigation than any other place in the country, by an order of magnitude. I’m sure Marshall is a charming town with nice people, but there’s simply no reason for so much patent litigation to go through there. We might as well have patent litigation go through Bangor, Maine, where I went to high school. The town is about the same size, but it has better food and it’s near the coast. Bangor also has a modern airport and a life-size statue of Paul Bunyan. Seriously, it’s obvious that something is wrong here, even if you don’t know the details. 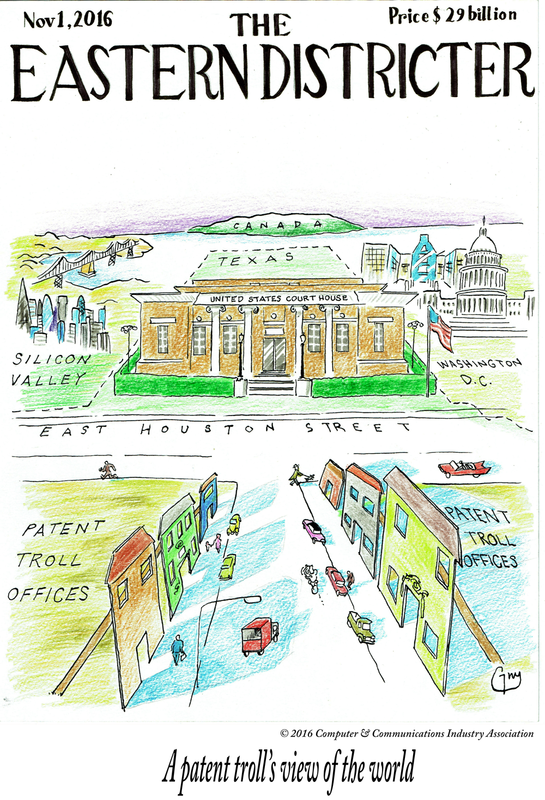 Patent trolls wouldn’t be flocking to a small town with no airport unless they had good reason. And they do have good reason. The rules in the Eastern District of Texas make defending against a patent case there particularly expensive. Documents have to be produced almost immediately, which means that a defendant has very little time before the bills go up into the hundreds of thousands of dollars. Judge Gilstrap doesn’t grant motions to transfer very often, which means that it’s difficult to get the case moved. One of the big reasons he doesn’t transfer much is that patent trolls set up sham offices in Marshall, and he uses those as a basis to reason that the case has local connections. The Supreme Court is currently considering a petition for certiorari that would address this issue, and there are bills in both the House and Senate that have been introduced. This situation has to change; let’s hope that change happens soon.